Hi Everyone! Thanks for dropping by! 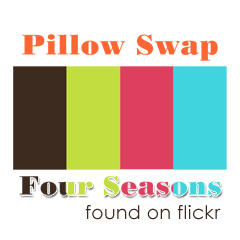 If you don't already know, I am co-founder and co-swap-mama to Pillow Swap Four Seasons. (Sandra, the hohenbrunnerquilter, the other half, keeps me in line and on top of things! She is so damned organized!) We had so much fun organizing our seasonal pillow swap, we decided to keep the fun going into 2016! What kind of group are we and what do we do? 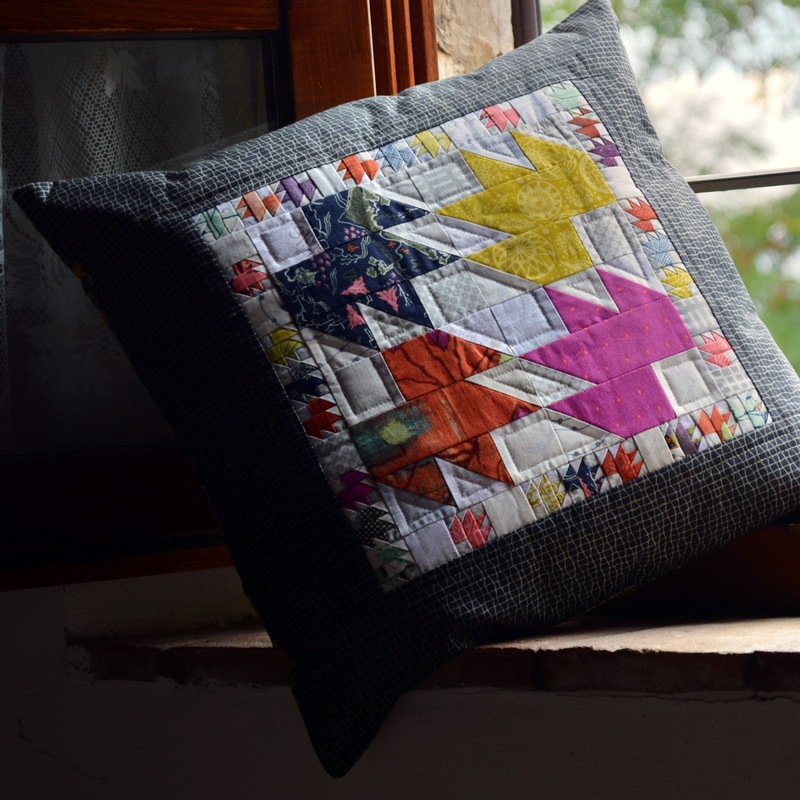 Well, we are an international group of quilters/patchworkers/sewers who love to celebrate the seasons by designing pillows for others within our group. It takes place four times a year. When you sign up, you are required to design a mosaic of inspiration as well as stating your interests on the registration form. This will help your new partner to "get to know you." After the registration period is over, you will receive a new, secret partner and aren't allowed to tell anyone who it is. 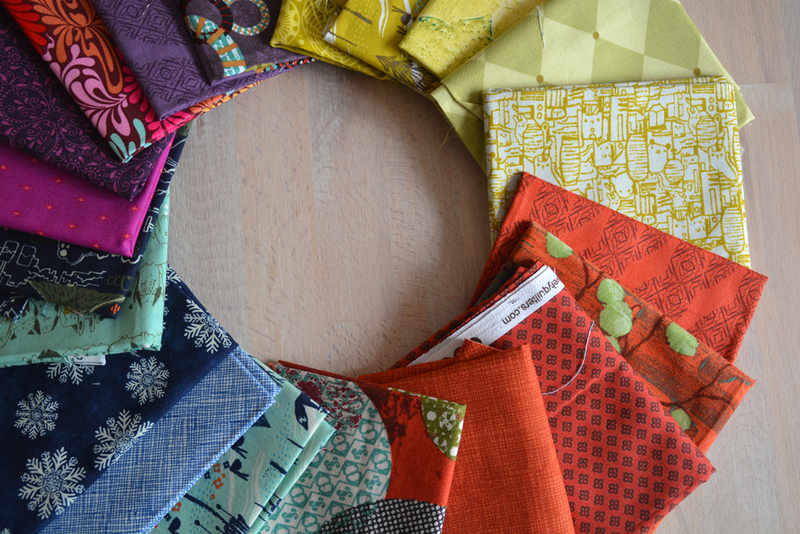 Then we post pictures of our fabric and/or design choices. It gets really exciting when we start this phase; sometimes you can guess who your partner is and sometimes not. It really is loads of fun. We are open to new participants - novice to expert. You will be grouped together with your years of experience in the hobby/field. Let me share with you some of the awesome pillows I have received this year (2015). 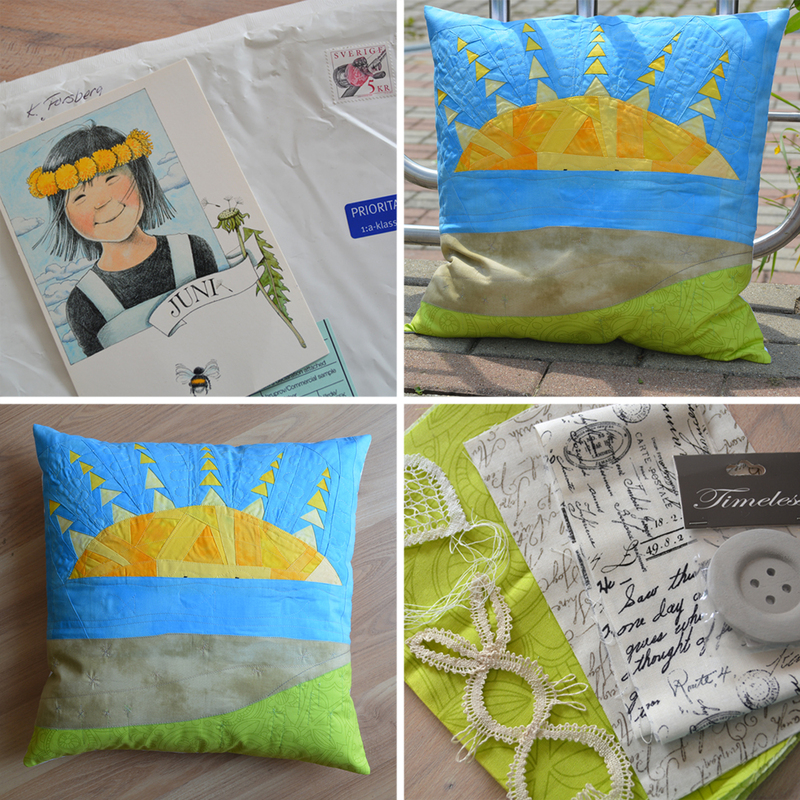 I received this beautiful pillow and big package from Tammy just this last week! Isn't it beautiful? I totally love cardinals, red and black. She incorporated all of that into the pillow. And she made me the cutest sewing kit, filled to the brim with sewing notions! Yes, I have been wanting to make one of these beauties, but I was more secretly wishing for one! Tammy read my mind too! She also send additional fabrics, her favorite tea, a card game from the Penn. Dutch and so many little goodies like the key chain and Clover clips hidden in the sewing kit. I totally loved the package I received from Carolin for our autumn swap too. I love a bit of whimsy in my pillows and Carolin made this cute Halloween pillow with a spider and a web. Look carefully, because Ms. Spider is made from a large black button. She also made that cute pumpkin pin cushion and mug rugs with foxes!! Soo cute! And of course, a Charlie Brown coffee mug! Right before summer I received this adorable pillow from Karin with the sun just peeking over the horizon! Just adorable and whimsical as well! She also sent along a few extra gifts of the cute bunny and heart. I have no idea how anyone can make such beauties?! And the postcard, just perfect! I have to say, all of my partners (the women sewing for me) were so incredibly awesome! They are so unbelievably talented, creative, and wonderful gift givers, too. Thank you ladies, Tammy, Karin, Carolin and Karri! You are fabulous! Click on the page above for more information. Click here if you would like to register. Please have a mosaic of interests ready before you sign up. Sign-ups close on Friday, Dec. 11, 2015. Partners will be assigned on Monday, Dec. 14, 2015. We look forward to seeing you there. 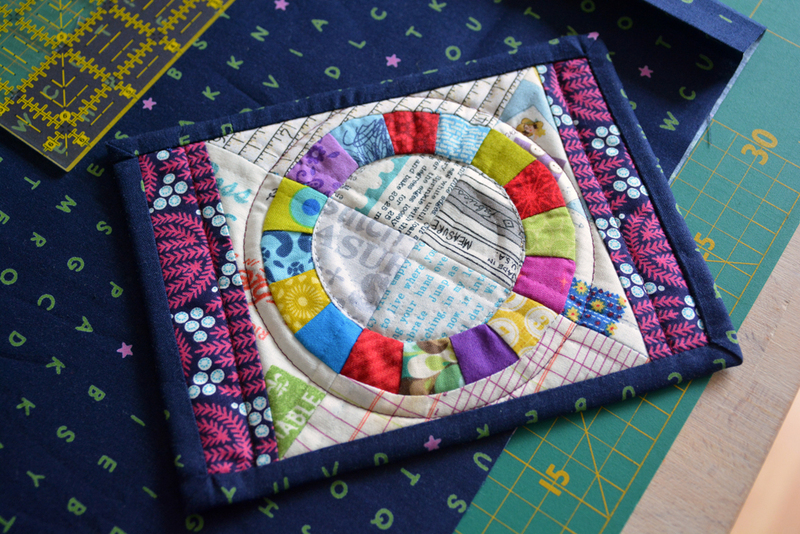 Welcome to a pretty little mug rug swap that lets you go wild with sewing curves! I found this adorable and free mug rug from Green Bee Designs and Patterns (Alexia Abegg) and absolutely had to try it. 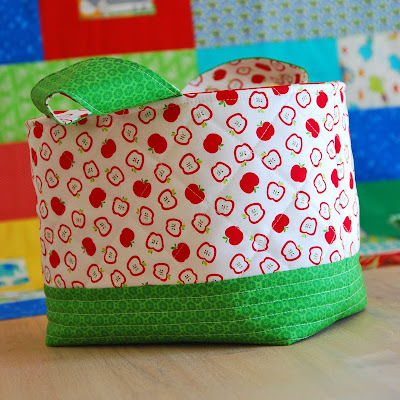 It is so cute and so much fun to make; I had to share my excitement with everyone and organize a swap just for the Little Bits Mug Rug pattern. So let's pay homage together, shall we? 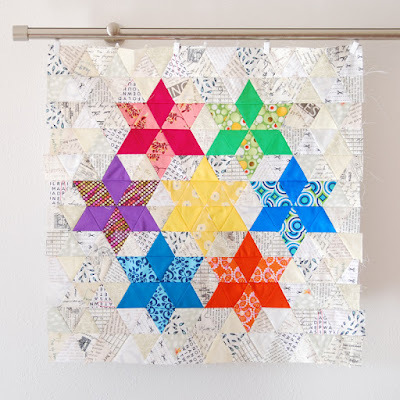 You will be required to use the free pattern from Alexia Abegg but are allowed to make slight alternations to it such as enlarging or shrinking the overall size, adding to it (embellishments, embroidery, or applique, etc.) changing up the border, whatever you like. But we should all still be able to identify the original pattern designed by Cotton & Steel founder Alexia Abegg. This cute and stylish mug rug should measure approximately 6 x 8 1/2 inches when finished. After you have registered, I will contact you to make sure your data is correct and verify that you are actively participating. "Flakers" will not be tolerated. What is a flaker? Someone who signs up for a swap and decides somewhere along the time span they have no interest in fulfilling their side of the swap. Bad, bad, bad. Yes, they do exist. Sadly! Everyone will be assigned a partner. This is an open swap and not secret; you will know who is sewing for you. You are allowed to contact them, and they are allowed to contact you. However, please keep their information (mailing address) confidential. 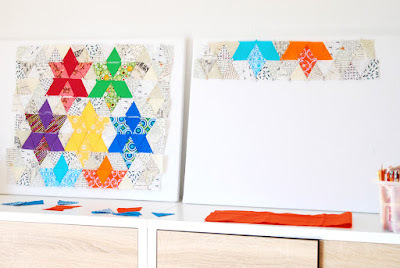 No mosaics are needed for this swap. You will be sew according to your partner's interests, social media feeds, and direction along the way. We really want you to guide your partner on the right path. If you have trouble making contact your partner, please get in touch with me. Check-in Date is January 15, 2016. 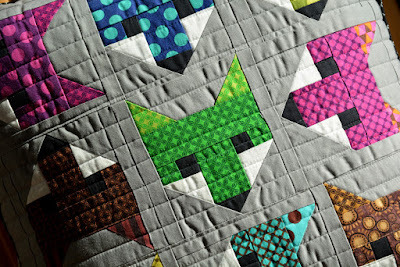 Please email me at karen@easypatchwork.de with a small pixel progress photo and this in the header: "Little Bits Mug Rug Swap." You may post a picture on Instagram of your progress as well with the hashtag #littlebitsmugrugswapcheckin. From all of the emails I receive and in the order I receive them, I will draw a number and that person will receive a very special gift. Please send the completed mug rug to your partner with a little note or postcard. You may send other items as well, but please don't over do it. Are you ready for a little mug rug swapping fun? Then go ahead and register. Open to 40 participants. 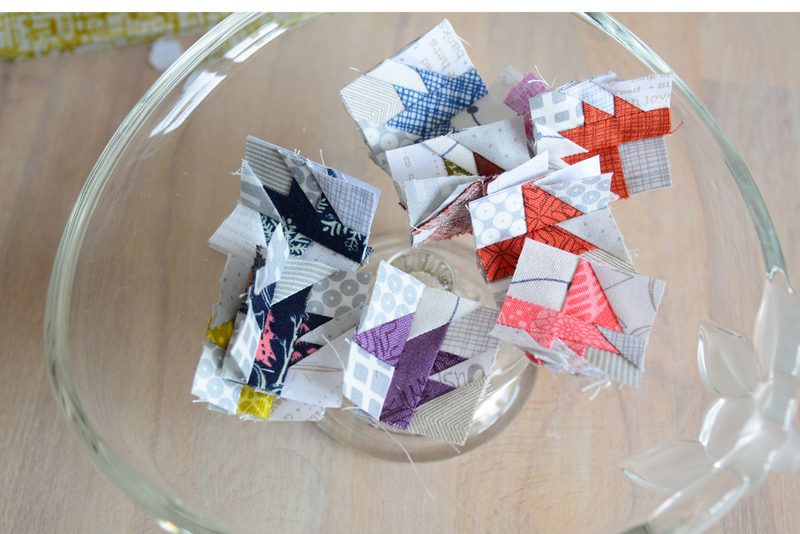 I look forward to seeing familiar and not so familiar faces on this quick little swap! Thanks for dropping by! If you read my blog post yesterday, I reviewed two baskets tutorials. They are very excellent tutorials to be checked out! But, I still wasn't totally happy with my baskets. These were going to become my Christmas presents for the year, and I wanted to get them right for all of my friends and family. I made another version of the one hour basket from Kelby. This time using the heaviest stabilizer available here in Germany - S 520, Vliesoline. I thought it worked much better to give the basket the stability it needed to hold its shape and purpose of a stairs' basket (that accumulates everything from the house). I also bought some heavy, home decor fabric which is actually cheaper here than quilting fabric. 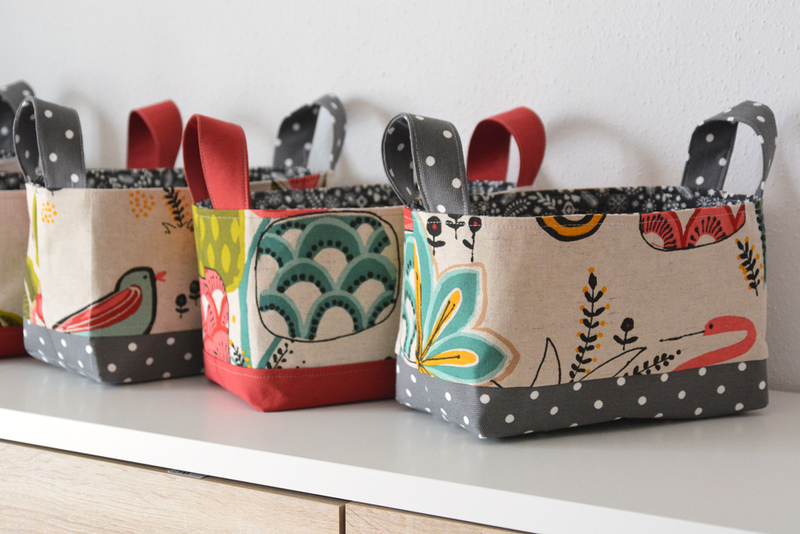 If you look at the gray baskets closely, that one on the far right was my first try with the heavy stabilizer and the home decor fabric. I used a medium weight stabilizer (Vliesoline S320) on the light, print fabric and a heavyweight (S 520) on the lower, gray, dotty fabric. Since this stabilizer is three times more expensive than "regular" I thought this would be a good compromise. The shape became very solid, maybe even too solid! 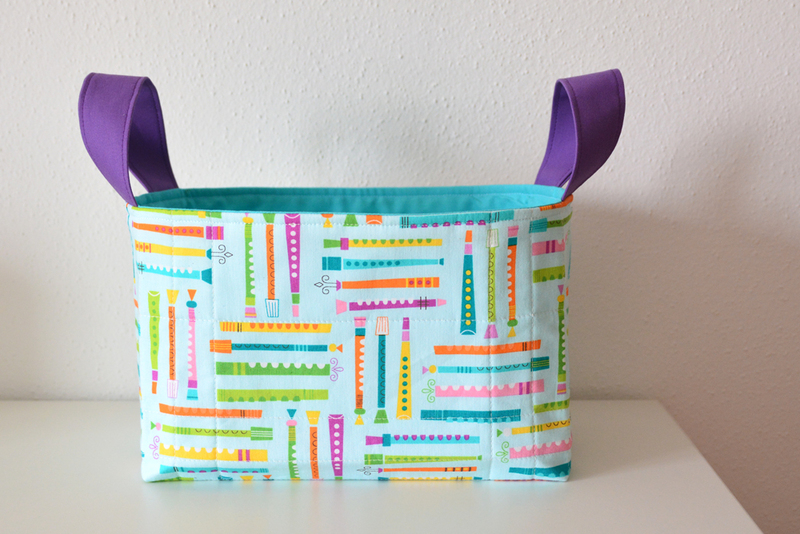 It is extremely hard to maneuver the basket under the sewing machine after the bottom is sewn shut and you are trying to attach the inner and outer layers. 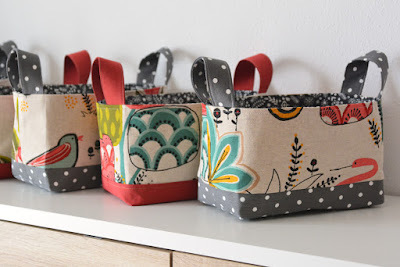 On the second gray basket (the next gray one you see to the left, sandwiched between the two red baskets), I top stitched 1/4" above the area where the print and dotty fabrics are sewn together. This definitely gives the basket character! I also top stitched 1/4" from the top of the basekt to keep the inner shell in place. 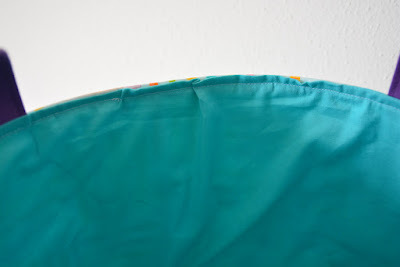 This seam is originally sews 1/2" seam allowance, but you can definitely top stitch lower than 1/8" from the top. I also attached the handles with a one-inch spacing from the center seam making the handles ends two inches apart. Okay, these were looking even better, and I wanted a little diversity with a fabric change. I used the "red/orange" fabric (also home decor and washed!) with a medium weight stabilizer (Vliesoline S320) on all segments of the basket except the inner lining. This worked out even better! It gave the basket enough stiffness to stay flat, but was much easier to sew under the machine when it came to attaching both the inner lining and outer shell together. The upper "linen-look" fabric I pressed downwards this time instead of upwards and top stitched on the bottom area with a beige cotton thread. I think it makes the basket look very professional! 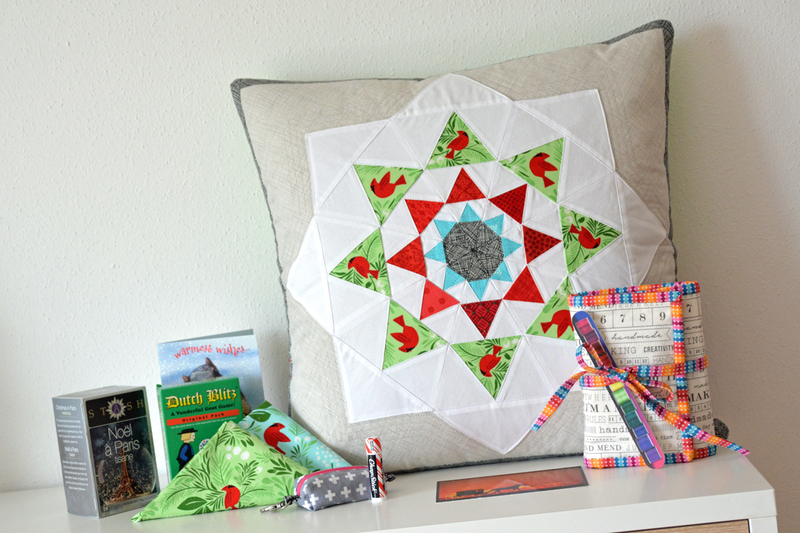 I didn't want to quilt a lot on this basket, because this is supposed to be a speedy project for Christmas, right? Even though I spent several days (one week) to perfect my "gift basket," it was worth it! Just think, I worked out all of the bugs for you to get started on your holiday baskets! 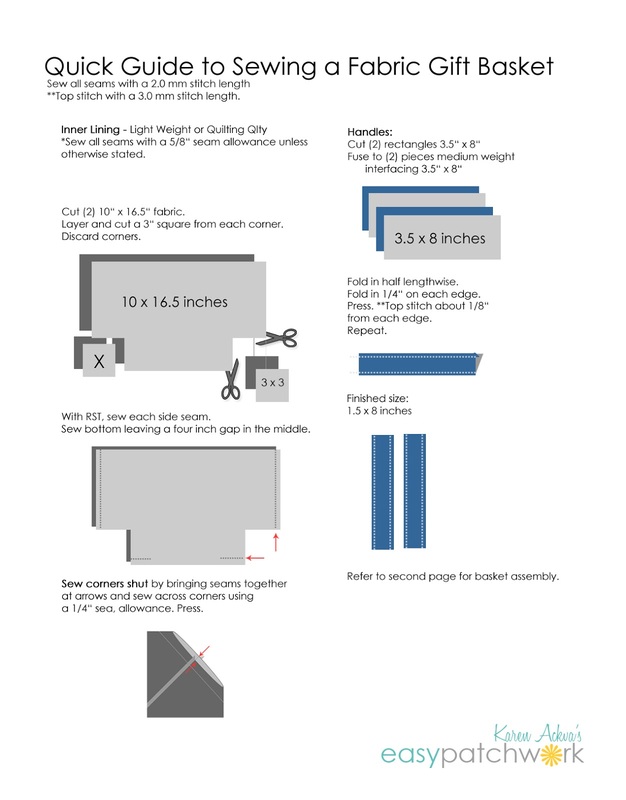 I have added a TWO-page cheat-sheet of how I constructed my basket. 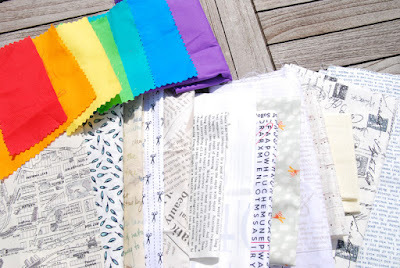 Go ahead and start scoping out some beautiful home decor fabric (heavyweight) for the outer shells and quilting quality fabric (lightweight) for the insides. You can download the cheat sheet on my FREE DOWNLOADS page. Donations are kindly welcomed and accepted. THANK YOU!. And if you are celebrating Thanksgiving today, happy Thanksgiving!! We will be celebrating on the weekend when we have time to enjoy it. Thanks for stopping by for the second part of the one-hour basket review! I sewed my very first "one-hour-basket" for a friend of ours that was having their first baby back in February/March of this year. 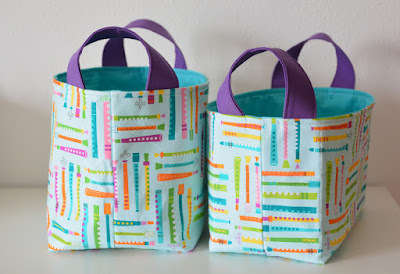 I used the Fabric Basket Tutorial from Trina from Will Cook for Shoes for the Fort Worth Fabric company. I thought the pattern went well. The handles were on the front and back of the basket. 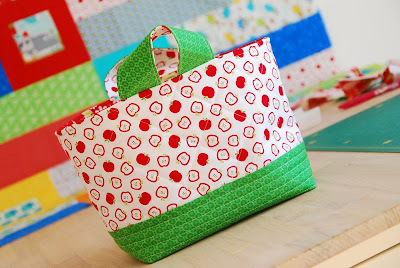 Then I saw the 1 Hour Basket all over IG (Instagram) with the hashtag #kelbysews. This basket looked a little better, peppier with a little more structure and with the handles on the sides rather than in the middle. Aha...another pattern which must be greatly improved? Kelby also lists her free tutorial Craftsy. 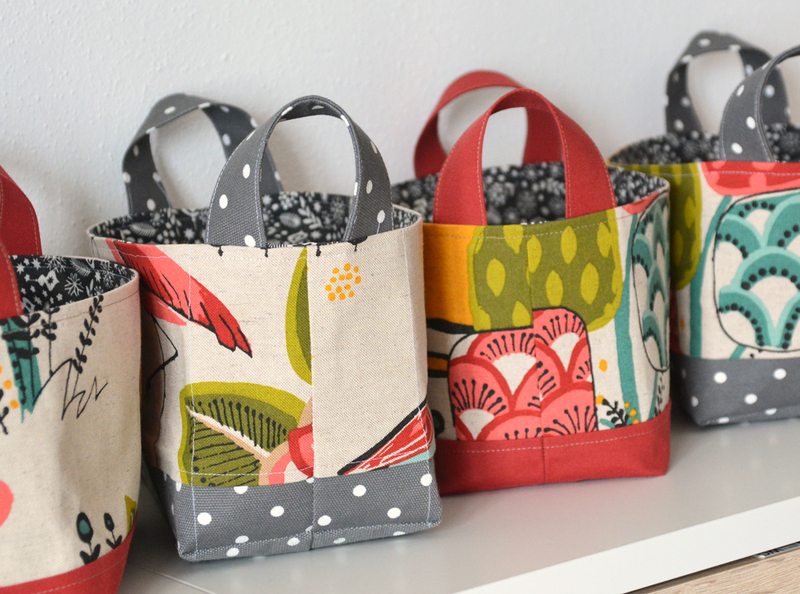 (As most of you, I like to find free patterns!) I downloaded her version to see what the difference was and if I would agree with her changes. I read. I practiced. I bought more supplies and wracked my brain about improvements and modifications. Here is my opinion after making a couple of baskets from both tutorials! The Fabric Basket from Trina is a very nice, tall and roomy basket made from quilting quality fabric that is quilted on the outer shell. The outer shell fabric is fused and quilted which gives it stability on the outside. The inside is also quilting quality fabric (which is rather thin) but reinforced with a medium weight stabilizer. The basket holds its shape nicely. The handles fold to the left and right in the middle of the basket. The inner and outer shells are connected at the top and flipped at the top. 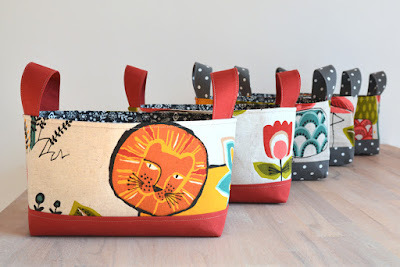 Fabric Basket Tutorial from Trina of "Will Cook for Shoes"
The 1 Hour Basket from Kelby is modified version. I say this clearly because of the dates of when both were published. 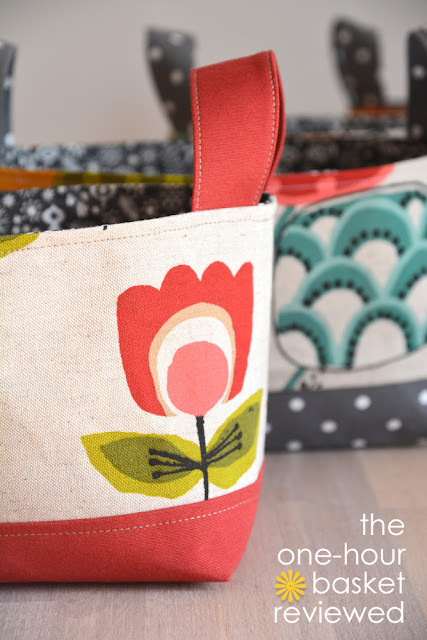 The basket from Trina was published in February 2015, and the one from Kelby in March, 2015. What changed in the new basket which sparked the need for a new tutorial? Although the 1 Hour Basket was as published after the Fabric Basket Tutorial, Shelby assured me she has never seen this tutorial before today. My apologies. What is different in Shelby's tutorial? 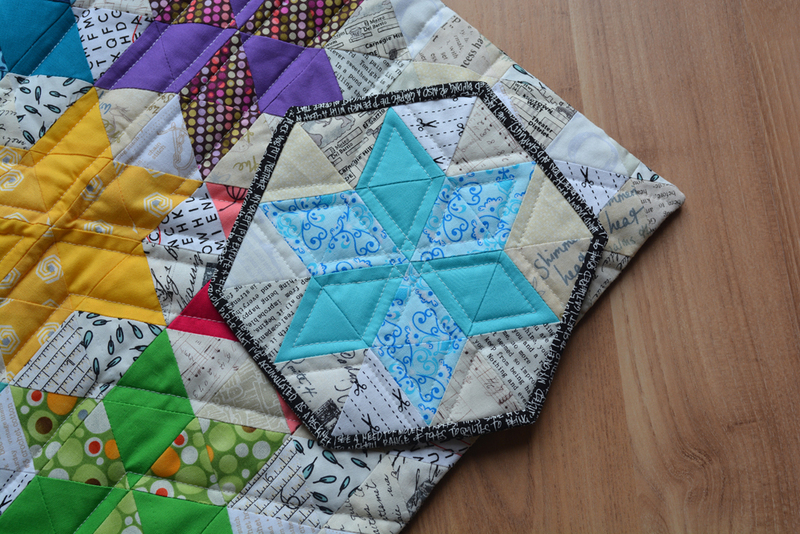 It is improved and a bit more thought out especially if you don't want to do a lot of quilting. the newer version is compact - overall dimensions make it shorter and longer. bottom base is slightly smaller. clears up the discrepancies for inner and outer shells (inner lining must be smaller to prevent puckering when top stitching the two shells together. 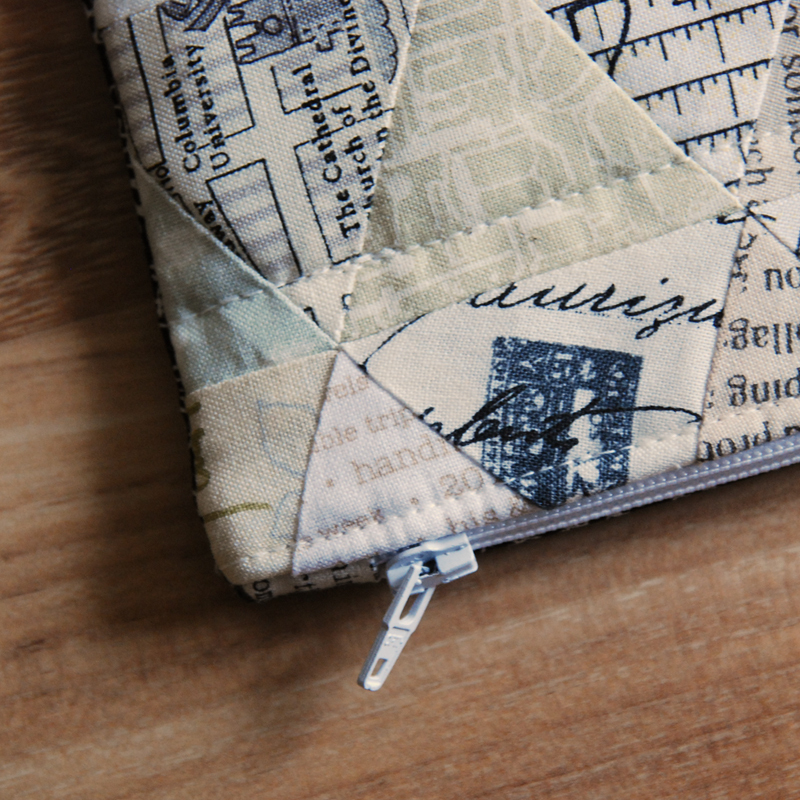 The inside was sewn with a 5/8" seam allowance rather than 1/2".) The picture below shows this puckering on the original basket. Both baskets look amazing don't they?? I agree, the photos are great! No use of stabilizer on the inner lining to make a shell. Handles on the ends instead of side. Sewed the handles like the first basket by folding in the center once and folding in again 1/4 on each side. Added cotton batting and quilted on the crease lines. No use of home decor fabric on outer shell nor on the inner lining. What is your opinion? Which one do you like better? I clearly like the second (improved) version better. But I think it all depends on how you are going to use the basket. If you are going to use it for holding diapers, I would clearly use the tutorial from Trina exactly as she wrote it, but I would flip through the top, because it makes for a better finish. I would also quilt it very tight for added stability. I think the handles on the front and back are just fine, but may need to be adjusted for your purposes. 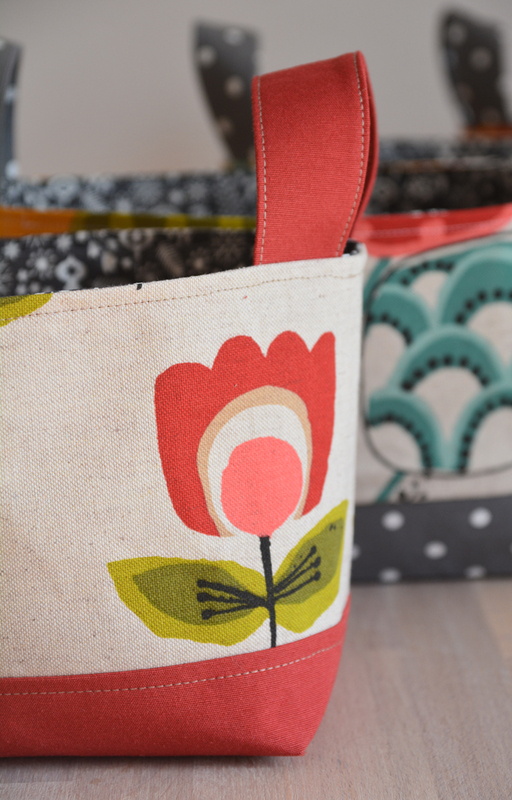 If you want a more decorative basket, I would pick Kelby's which proves to be a quick sew with little hassle. I would adopt the handle size and length from Trina's tutorial though. I think they look better short and stump. But keep in mind, both of these baskets take a while to sew. Make sure you read through the tutorials carefully to understand. If you are interested in how I fine-tuned the basket for my Christmas gifts, stay tuned.....Part 2 will be posted tomorrow! If you are celebrating Thanksgiving today, happy Thanksgiving!! I heard that the Carolina Panthers will be playing today! Yeah, go Panthers!! We will be celebrating our turkey day on the weekend when we have time to enjoy it, without the stess of work and school. Thanks for stopping by! Almost another whole month has gone by without me posting. I have not only gotten sucked into the Instagram world (whole-heartedly) but I've also become very productive. I know I should probably post more about what I have been doing, but I just keep finding more projects and investing the time into my sewing instead of blogging. I have a lot of secret projects at the moment that may or may not be printed, but what I can show you is a pillowcase that I am really proud of! 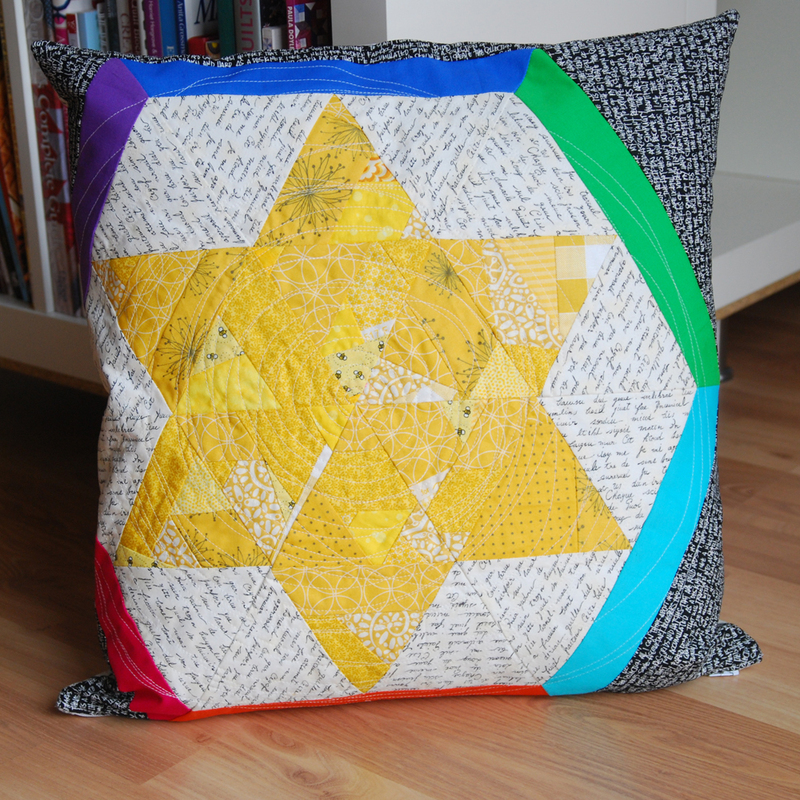 I made this pillow for my secret partner on Pillow Talk Swap IG Stlye. Unfortunately, the person who I designed the pillow for and sewed it for, went MIA (missing in action). She not only did not post when she was sewing for her partner, but also removed her mosaic of what she wanted sewn for her. <<shaking head>> Well, there are always going to be flakers in this world aren't there. Schade. Schade. I hope this pillow will find a new home, but it may just stay with me. = ) Who knows? 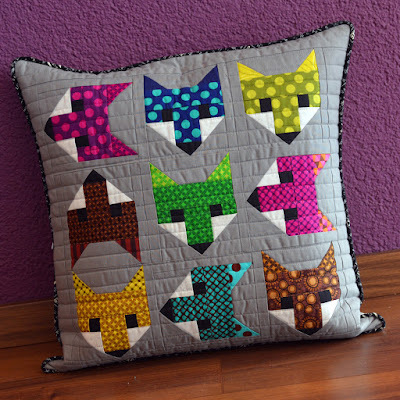 I love Elizabeth Hartman's Fancy Foxes pattern and this is what my partner had in her mosaic. I thought I would make it very bright and cheery and a little quirky with some of the faces spinning in circles. I designed the block using EQ7 and changed the sizing of it to fit a five inch block. This illustration shows the main center with the nine foxes. I added a 1 1/2" border strip all the way round making it 18" square. The fabrics used are mostly from Micheal Miller Fabrics - Gem Tones from just one charm pack. 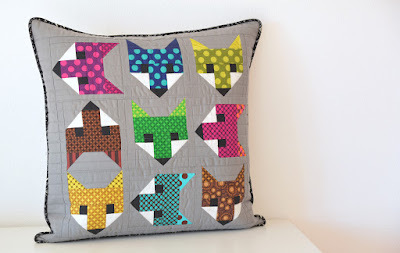 You can not get a whole fox face out of one charm the way I sewed mine together. The ears on mine are folded over with one whole piece of fabric sewn on the diagonal for added dimension. As you can see, I that pretty striped orange fox didn't make the final cut. 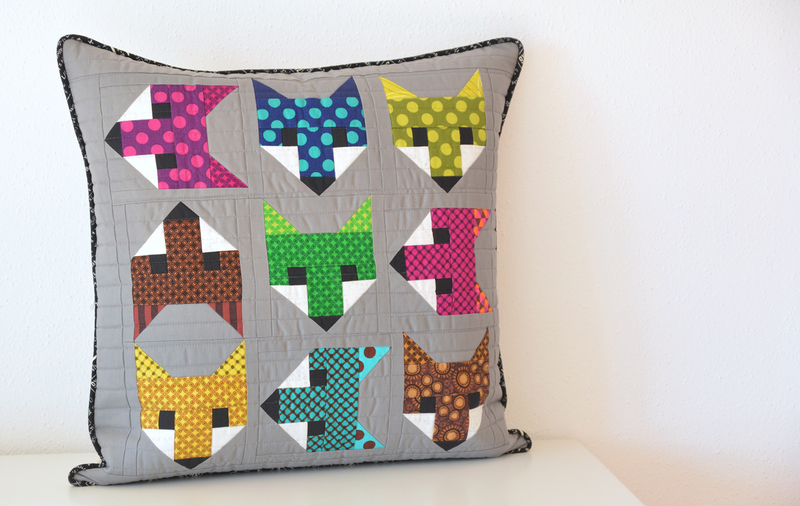 Even though the fabric is so beautiful, it didn't look that impressive as a fox for this pillow. It might become a mug rug though. The white is actually from Zen Chic with cute circles called Modern Background, Ink Zen Silver, XOXO. The black is a simple solid from Kona. I even added a little piping to it to make it pop right out. 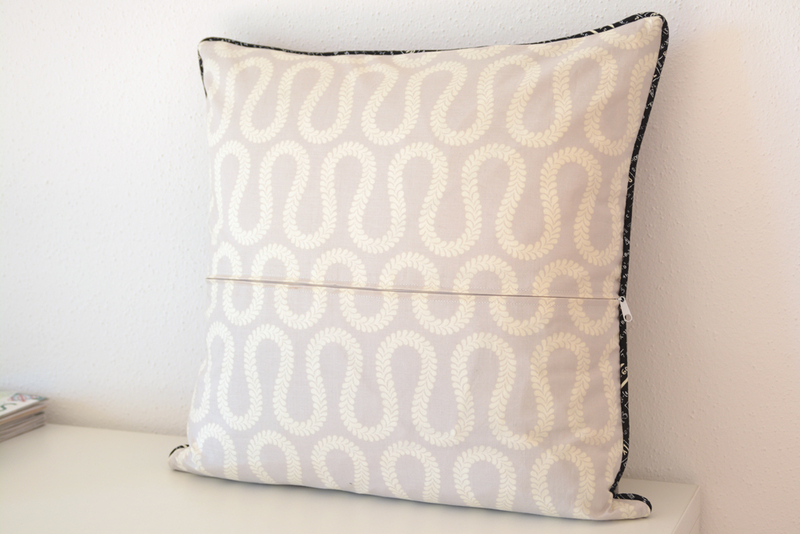 This was my first try at piping in a pillow too. 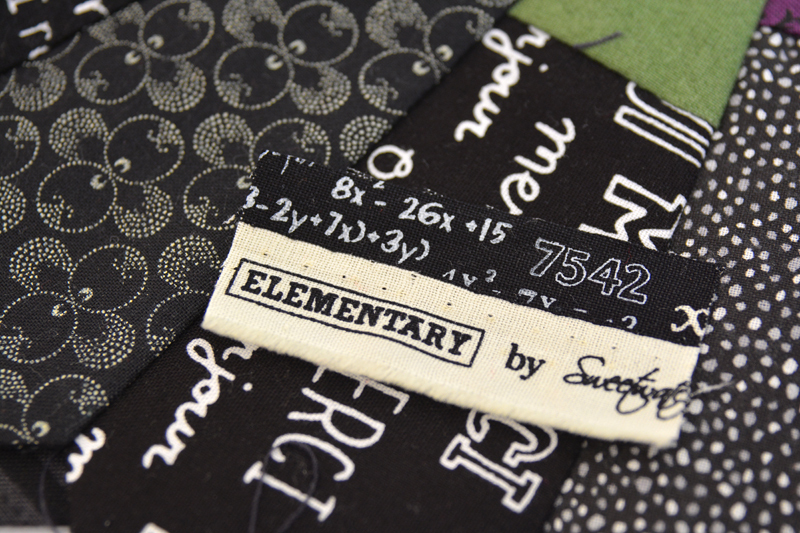 The black fabric is from Sweetwater for Moda called Elementary Equations. This was my fabric of the year 2015. I used it several of my makes and totally love it!! 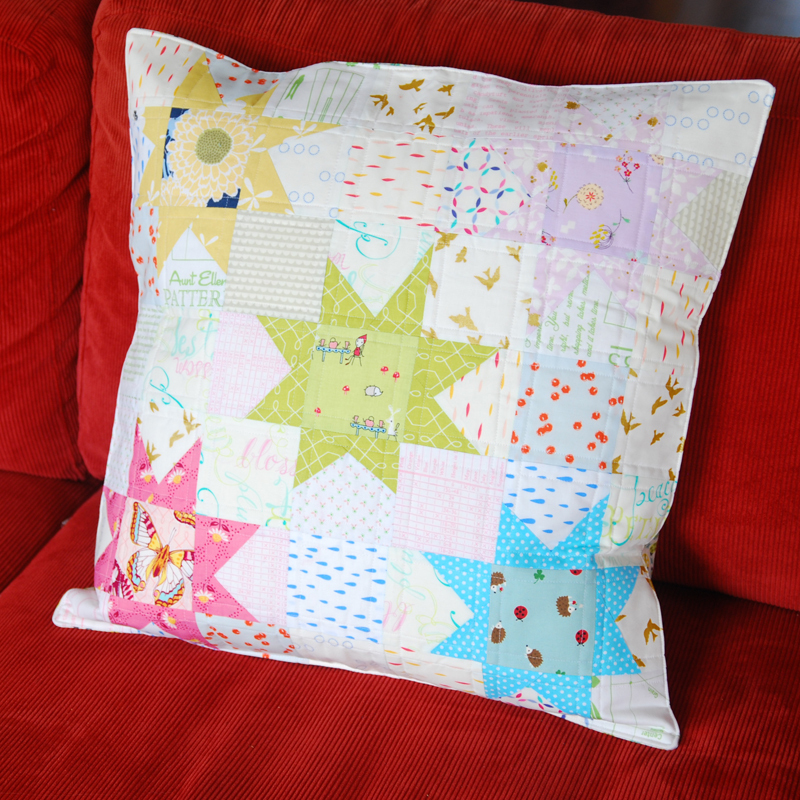 After the the pillow top was finished, I decided to quilt it with a Monofil (transparent) thread. I have tried to use this thread before, but with little success. This time, I worked a little harder at adjusting my top and bottom threads to get the perfect balance so the bobbin thread doesn't show. 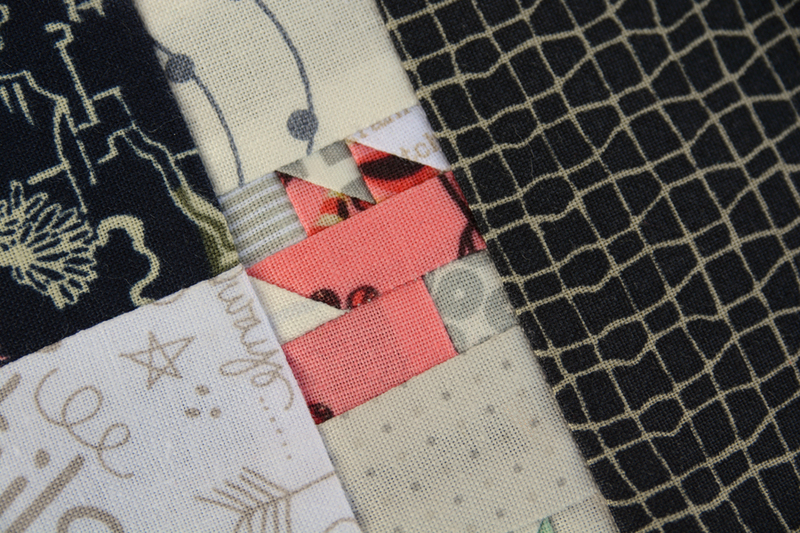 I also quilted using a straight lines every 3/4 inch. And I used a little bit of Tula Pink fabric I had reserved for another project for the back. It was the perfect size when I cut the WOF in half on the fold line. I also managed to line up the pattern to make a smaller wave through the middle. I love it when a plan comes together. And if not, I hope it is loved and cheerished in its new home. Thanks for dropping by after a very long absence! I'll try to get better about posting more often, but then again, I won't be able to sew as much...okay, I have to find a happy balance! Thanks again fro dropping by! Good morning everyone. Well, another few weeks have gone by and still no new posts from me. I am such a bad, bad girl. 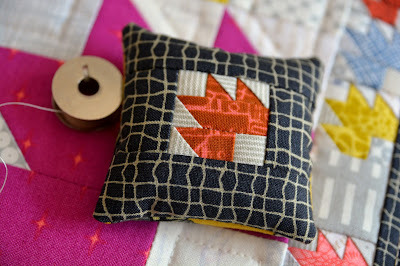 ;-) I've been busy like all of us; just using the extra time I have to sew instead of blogging. Since we are in the middle of fall, I thought I would share my beautiful, autumn pillow that I made for my sweet Pillow Swap Four Seasons partner, Betti from Bettis Stitches on Instagram. What do I want to say about this pillow?.... It was really fun to make! If you know me, you know I like a good challenge! And this time, I wanted to sew something really small. I took the traditional maple leaf pattern from EQ7 and designed my own pillow using the fabric line Tucker Prairie from Moda. This was my original design from EQ7 with a triple border. You can see from the final pillow, I removed the second patchwork border; I thought it was a bit too much in the end and was a little too loud or "unruhig." My fabric pull came together rather quickly. I wanted blues, oranges, yellow-greens and purples. This may not be your "traditional" fall color palette, but I wanted the colors to jump out and be vibrant. I wanted to ground the entire idea by using low volumes for the background. 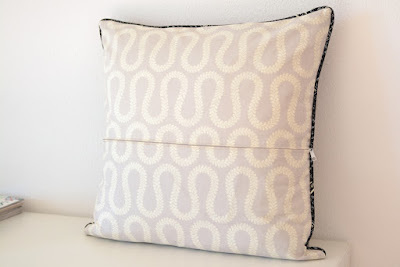 I didn't purchase any new fabrics for the front of the pillow and most came from designers such as Tula Pink, Brigitte Heitland for Zen Chic, Carolyn Friedlander, and Sarah Watts if you want to recreate this. The outer border fabric was still undecided at this point. 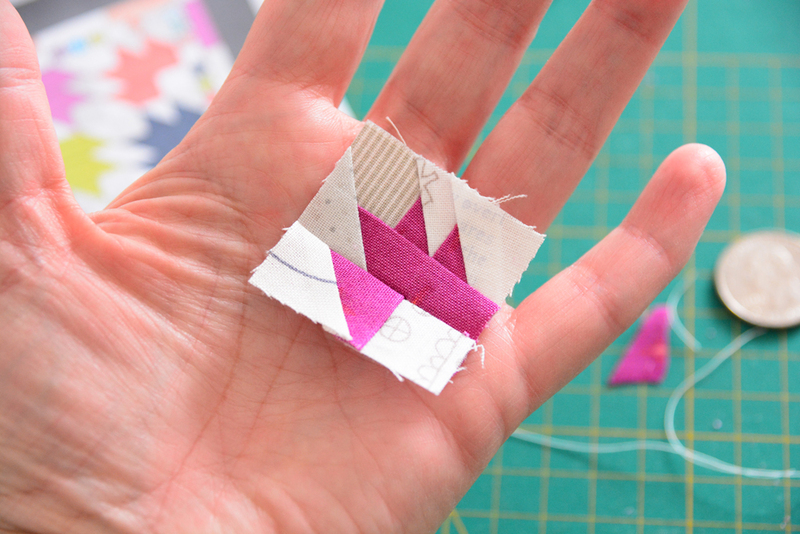 After I made my "big blocks" out of the way, I started with sewing my teeny tiny leaves. I actually found out that the leaves go together very easily when you know two principles - traditional foundation (paper) piecing and sewing on paper "sew-all-at-once" method. Each leaf took about 15 minutes to make. I made about 30+ one-inch leaves for this project. Sew Section A exactly as your normally would on paper using a smaller stitch than usual. 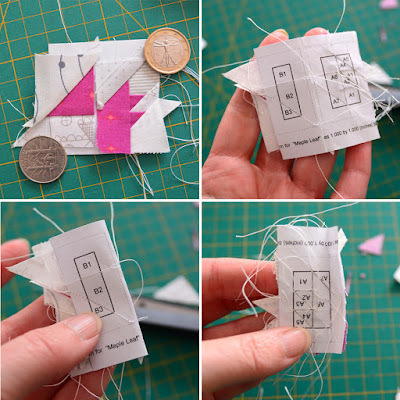 I use 1,5 stitches instead of 2,5 when sewing on paper. Make sure none of the fabric extends over the folded line. 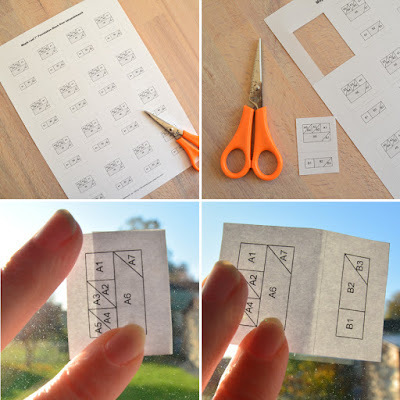 If it does, cut it away by folding the paper in half and cutting off what extends over the fold. You may reference a previous tutorial here. After you have made your leaf, iron it well and trim the block along the seam allowance line. The block should measure 1 1/2 inches. Use the blocks however you wish. After I made all of my mini leaves, I arranged them together for a matching border. Yes, it is matching. AND there is one leaf that is a little wonky! Can you find it? I didn't notice my wonky leaf until after I sewed the border on! I showed it to several people and no one noticed! I did take the time to change it, because I would have have been a eye sore for me in the end. I finished the pillow top by sewing on a 3" finished border of black around the center and first border to make the entire center pop out. 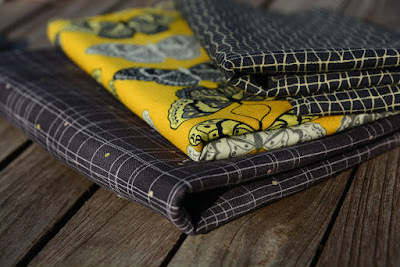 I chose a matching butterfly and black print from Westminster Fabrics. It has the same yellow as the leaf on the front. I know I took a picture of the pillow from the backside, but I must have deleted the photos. You can jump here to Betti's photo of the backside. 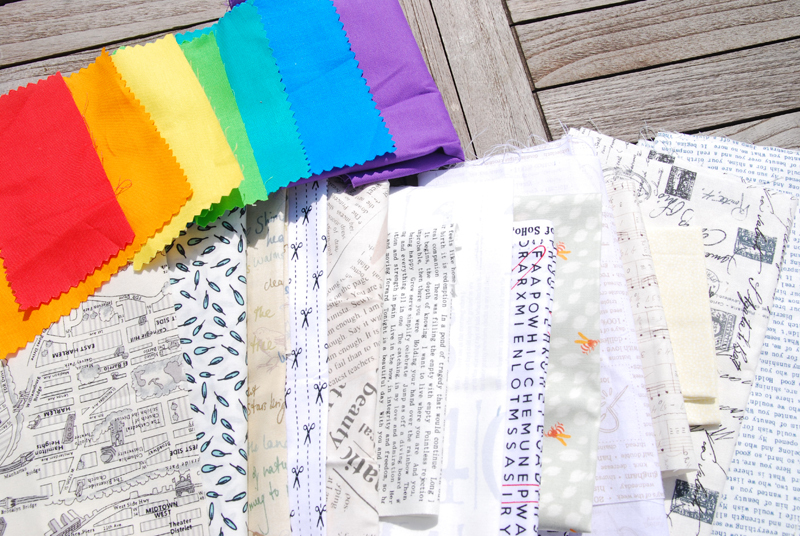 This was as selection of possible fabrics I did buy to finish up the pillow. 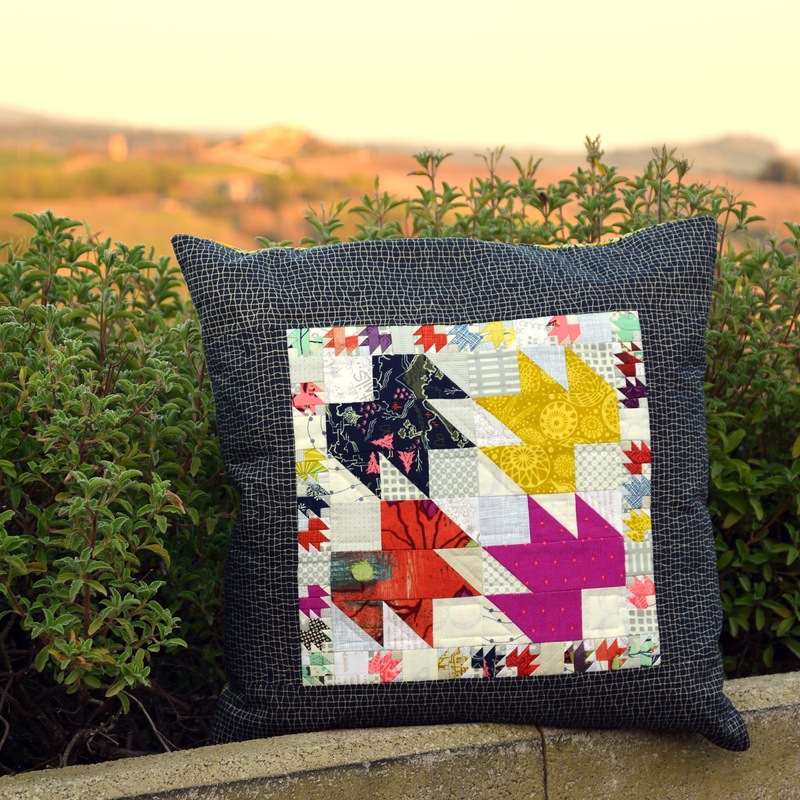 I used the yellow butterfly for the back and the black checkered for the outer border. I didn't like the bottom fabric with this pillow. It had a strange hue to it. 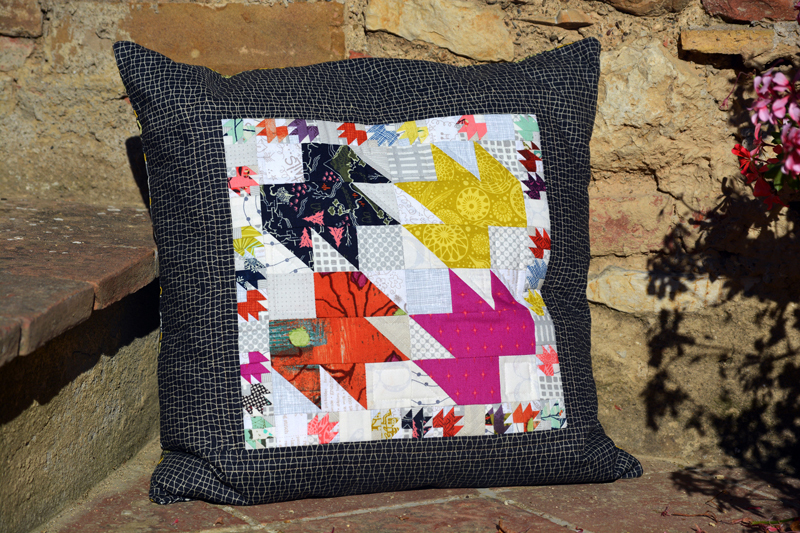 Thank you for joining me for explanation of my autumn pillow for Betti! I really and truly had a lot of fun making this pillow. I learned that I love to sew small! I hope you discover you like to sew small too. It really is achievable as long as you know and use a few special techniques. I did not expect to get distracted from blogging for so long, though! 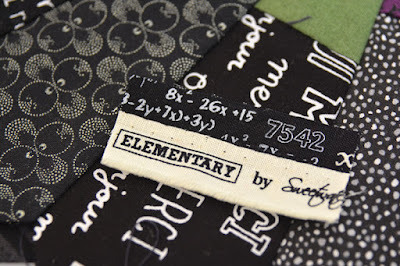 At the end of the school year, things were getting hectic, no more time for sewing, party here, party there, taking on new official sewing projects, finishing up the old ones, and had simply no more time to post! Well, I am back again. The kids are in school now, and I have a little bit of me time for myself. So, I wanted to get back to posting on a regular basis. Yes, I really do! Please forgive me! The summer was fantastic, and now I am ready to "get back to work!" I have to admit, my style is a bit more "low key" using more solids than LV so it was a little challenging to sew how I could design and sew something for her that I could really poor my heart out into. 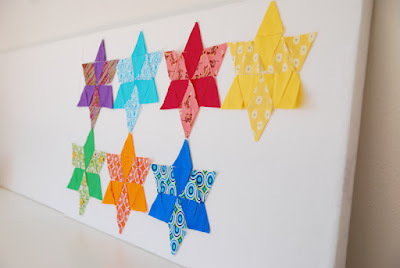 I took the idea from her six-pointed star and made a circle of them which is typically called "Seven Sisters." 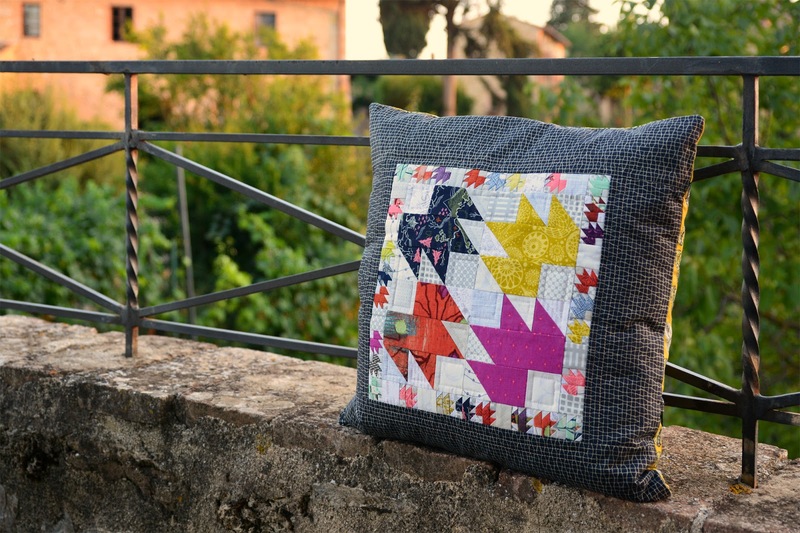 You will usually see this pattern and design made using English Paper Piecing (EPP). But, I love to piece on the machine, so I wanted a "simpler" way to make the stars and decided to make them using 60° triangles instead. Design: I started playing around with the below design in EQ7. I usually design all of my quilts using this program. My first design hat a border, because I like a "clean" area to attach the backing fabric when sewing pillows. 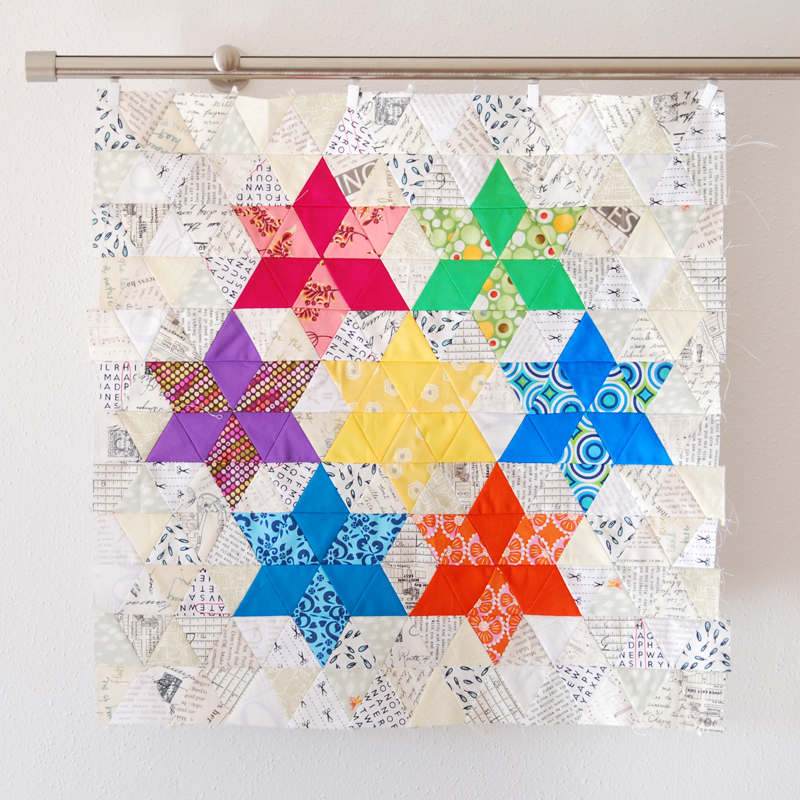 In the end, I changed my mind and added another row of LV triangles. My first challenge was finding low volume fabrics! My friend, Mara, in Greece helped me out with those fabulous LV you see in the picture below. I didn't have any, and she was kind enough to offer me those beauties from her personal fabric collection. 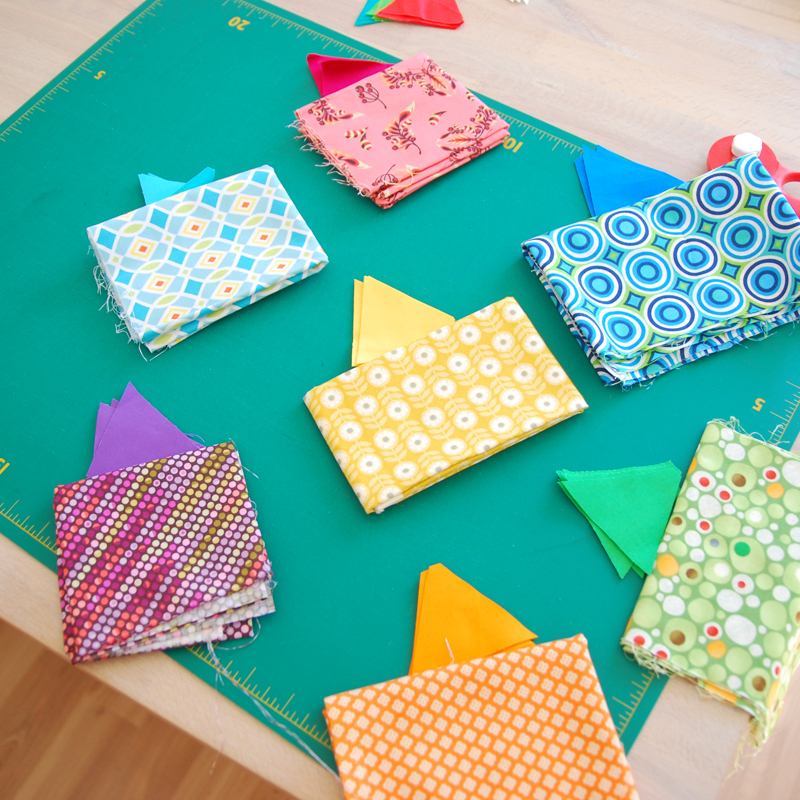 The solids are from a Kona rainbow charm pack.This was my initial pull and starting point. I pulled a few other coordinating fabrics for the stars. Once again, this was my first choice that I really liked. I didn't use all of the fabrics and changed my mind throughout. ;-) If I made the pillow over today, I think I would have used this yellow print in the middle instead of the one I used. I think smaller prints work better with the 2 1/4 inch triangles. I laid out my stars to see if they had the right contrast and "pow" appeal. I was content with these fabrics. I let them stay on my design board for a day or two. Next phase, cut out over 200 pieces from over 30 different fabrics (!). 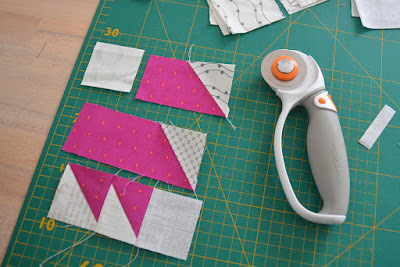 Sewing: I carefully layed them out on my flannel design boards. I didn't have room for all pieces on one board in the beginning. ;-) Then I started sewing the rows carefully together one after another. 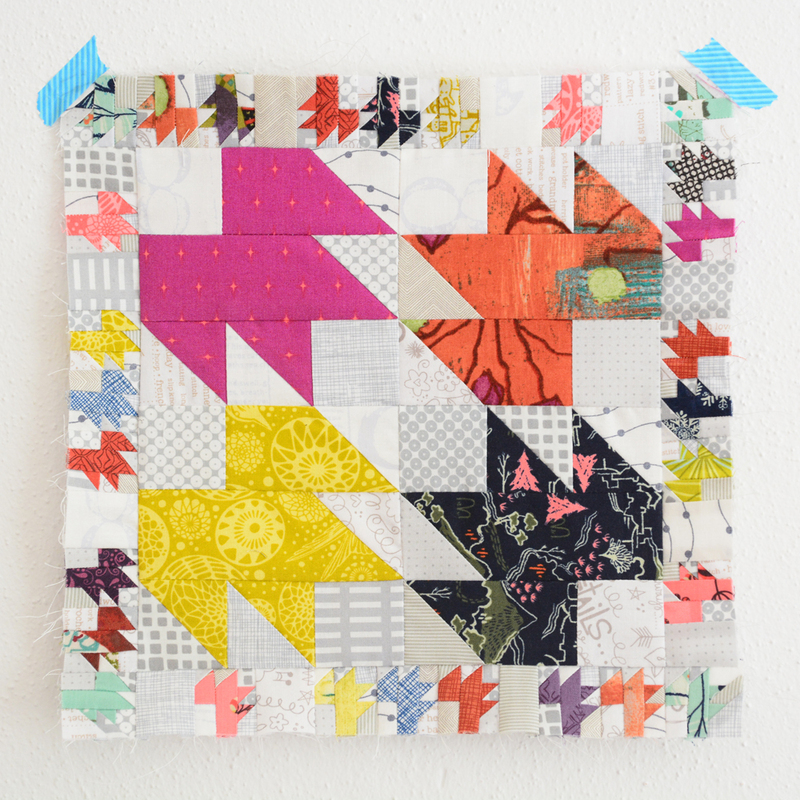 Triangle quilts are really rather simple. I have sewn four or five already. The true key is to sewing successfully is to sew every odd row to the right starting from the left. 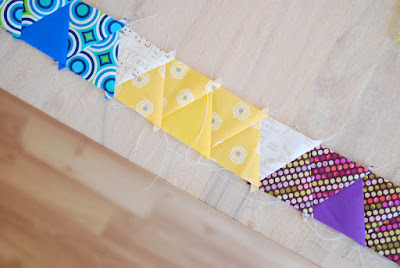 Start your even rows by taking the last triangle in the row and sew them to the left or upside down. Then they will always nest! After the rows were finished, it was easy street from there. ;-) Do you see the turquoise star? What is your opinion about it? Does it work? I wasn't so sure about it. I looked at the setup after dark and noticed it was rather light in value. The next day I found a better coordinated for the blue. Now all outer stars are brighter than the middle star and equal in value. 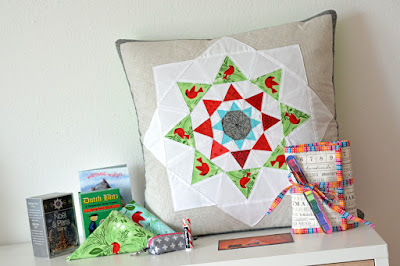 Of course I didn't throw out that lovely star!I used it to make a mug rug! Every pillow needs a matching mug rug, doesn't it? Quilting: I first wanted to do an inner outline quilting on the whole pillow, but thought I wanted to bringing another design element and made 60° angles through the middle of the pillow. 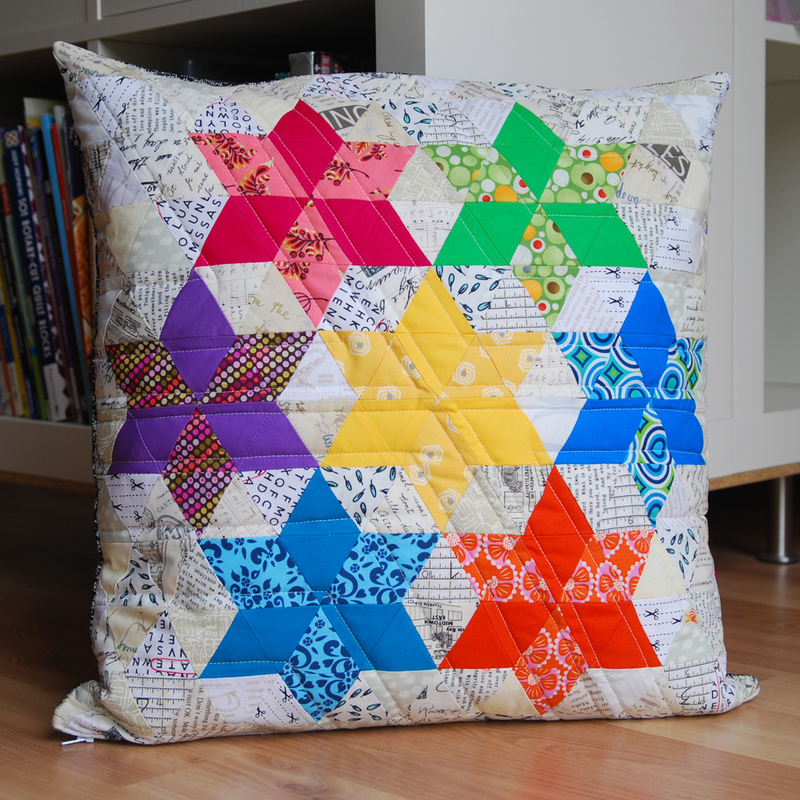 I am happy with the end result, but I am not happy that I chose to use Vliesoline H640 on this pillow! It gives it way too much depth. I learned my lesson here. 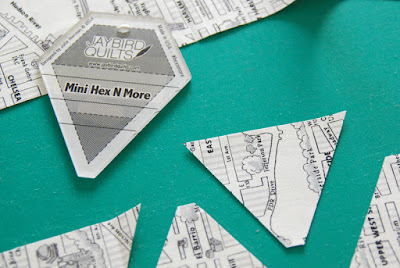 ;-) Today I might even be brave enough to use black thread for the quilting too. 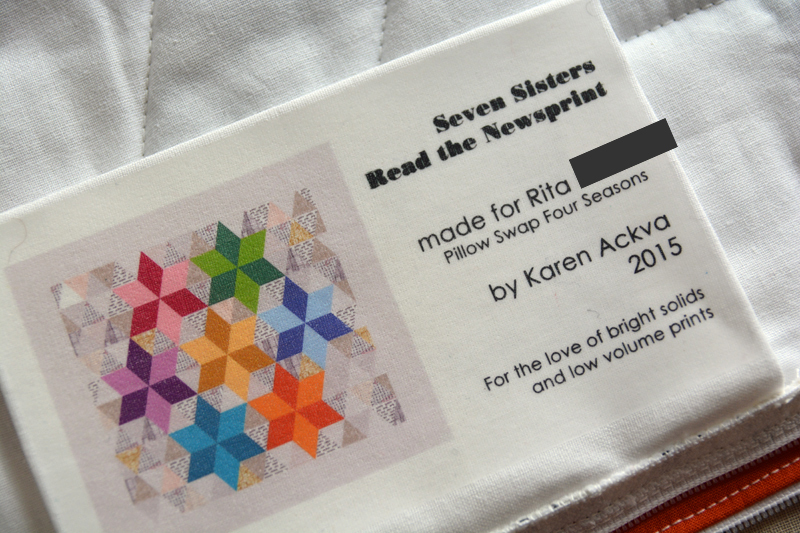 And I love the label I made for Rita! I transferred the design onto t-shirt transfer and ironed to a white piece of fabric and sewed it into the inside of the pillow. If you are inerested in swapping pillows with a fabulous group of ladies, we still have a few vacancies open for an energenic and creative patchworker. More information under the tab "Pillow Swap Four Seasons" above. We have an online form in the pillow swap Flickr group. Thanks for dropping by. I hope to be around more in the future as well!